"Amplitude modulation (AM) is a modulation technique used in electronic communication. In amplitude modulation, the amplitude (signal strength) of the carrier wave is varied in proportion to the waveform being transmitted." Below is an example of how AM is created, by the carrier wave and a message signal. 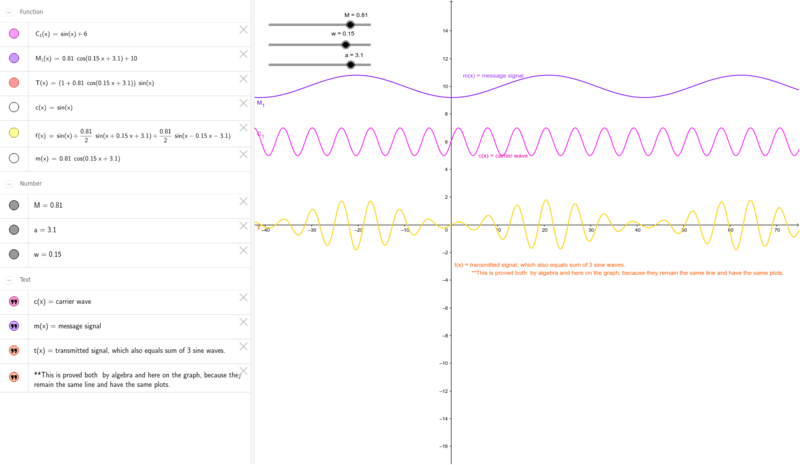 Trigonometric functions show these waves in 2D form. We have a carrier wave as c(x)=sin(x), and our message signal as m(x)=Mcos(wx+a). M is the amplitude, w is the idea of a frequency and a is position of the wave (the shift). The final product is a transmitted signed - "encodes the message onto the carrier" - its both the carrier and the message together - creating the function - (1+m(x))(c(x). **Using simple algebra and trigonometric functions we find that this equation is also equal to the sum of 2 sine waves, which is proven below because the two overlap. The positioning of M(x) is just the addition of 10 to the original function, so it can be moved up and isn't lying on the x axis. Similarly, c(x) is added by 6, so it can also be visible and not overlap on the x-axis. This just show where the AM has originated from and the similarities between the 3 functions.